The curtain call begins in The Wicked + The Divine #40, by writer Kieron Gillen, artist Jamie McKelvie, colorist Matthew Wilson, and letterer Clayton Cowles. The Pantheon has figured out a new way to stop the Great Darkness, but is it real or just another trick of Minerva’s? The issue kicks off the last story arc with a literal bang. Using a series of recovered recordings, Baal’s last show at London’s 02 Arena is chronicled. Woden, Baal, and Minerva have set up the arena to mimic Dionysus’ hive mind effect and then plan to use that energy to make a tremendous sacrifice, one that they believe will stop the Great Darkness while killing everyone in the crowd. Various recordings show Baal agonizing over this, fans getting pumped for the show, Minerva plotting something new with a mysterious being she refers to as a “little monster”, and more. As the sacrifice begins, though, an X factor is added to the situation that throws things completely out of wack. Kieron Gillen pulls out a lot of stops in this issue. The way the story is structured is novel, using a series of recordings to capture all the feelings of the fans and the Pantheon themselves. This being Wic+Div, there’s a lot going on in each vignette. One of the longest involves some Pantheon fan vloggers and it doesn’t really look like it has much bearing on the story until the end reveal. It feels a little like the “Tale Of The Black Freighter” section of Watchmen, in that it takes a lot of the themes of the issue, shows them in microcosm, and doesn’t completely make sense in its context until one reads the entire issue. The way the story is laid out is a brilliant piece of writing and this section is as much part of that as anything. As far as opening a story arc, this issue delivers solidly. The question of the Great Darkness is still given no definitive answer; even though it seems like all of this is being done to stop it, the section of recordings that deal with Minerva and her “little monster” throw some of that into doubt. She’s trying to use this whole situation for something big and new and Gillen knows how to keep readers on the hook, giving them this quandary and the mystery of who or what her “little monster” is. Another nice touch is Baal agonizing over what they are about to do. Baal has been making child sacrifices to keep the Great Darkness at bay since he ascended and it’s worn on him. With this new sacrifice, he rationalizes it by telling himself that this time at least it’s only adults, but it still tears him apart knowing 20,000 people are going to die. He’s been doing what is “necessary” for a while, but is quickly reaching a breaking point. This is top notch character work from Gillen. As for the art, there’s no big action set pieces or insane technical creations or any of that sort of thing. 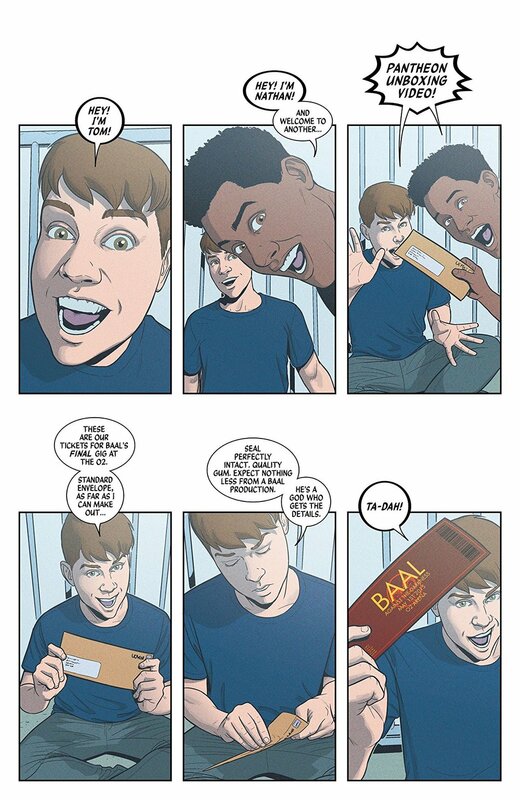 It’s all very personal and McKelvie’s art is perfect for that. He captures the emotions of the story’s players perfectly and gets across Baal’s inner turmoil, Minerva’s manic glee at her new plan, and an eerie scene of the crowd enraptured by Baal’s music and the hivemind tech wonderfully. As the kick off to the last arc of the book, The Wicked + The Divine #40 delivers perfectly. It begins the set-up, giving readers new mysteries to mull over. It’s structured perfectly and the art pulls it all together, taking a lot of “faces in the crowd” and making them into people that readers will get invested in. This is a book that often has a lot to love going on in it and this issue is no exception.